Jonathan Lunine, planetary scientist and physicist at Cornell University and NASA’s Jet Propulsion Laboratory, spoke on the harmony of religion and science Nov. 8 at the Collegium Institute for Catholic Thought and Culture in Philadelphia. It’s an old argument: religion and science are incompatible. But for Catholics — whose great legacy includes such luminaries as the founders of modern genetics and the Big Bang theory — it’s also a fallacious one. 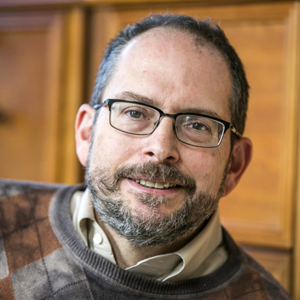 So began physicist Jonathan Lunine’s guest talk on his personal journey in faith to Catholicism this past Nov. 8. Lunine has worked as an interdisciplinary scientist on the Cassini mission to Saturn, the James Webb Space Telescope, and is a co-investigator on the Juno mission launched in 2011 to Jupiter. As an academic, he is a planetary scientist and physicist at Cornell University, and a Distinguished Visiting Scientist at NASA’s Jet Propulsion Laboratory. He is also a Roman Catholic convert. Speaking to a crowd consisting mostly of students from Drexel University and the University of Pennsylvania, also including professors, priests and seminarians, Lunine expanded on the venerable and rich relationship of the church to varying fields of natural science. He focused specifically on the Vatican’s centuries-old patronage of astronomy, which was initially used to reform the imperfect Roman Julian calendar into what is now known as the Gregorian Calendar (for Pope Gregory XIII). The reforms were key to more accurately predicting the date of Easter and the moveable feasts attached to it, like Pentecost, and led to the founding of the Vatican Observatory, which is a respected institution in the field of astronomy in its own right even today. The talk was organized as a part of a “food for thought” series run by the Collegium Institute for Catholic Thought and Culture, an independent scholarly foundation devoted to fostering the Catholic intellectual tradition within the Penn community. Lunine was brought in as a part of the Collegium’s own “Magi Project,” an on-campus program of workshops and after-hours lectures funded in part by the Templeton Foundation and dedicated to highlighting the links between science and theology. Lunine has a particularly close relationship with the Vatican Observatory and its director, Jesuit Brother Guy Consolmagno, and attributes his own conversion to Catholicism from his research and collaboration with the scientists there. The observatory’s scientists are nearly all Jesuit priests and brothers, and they incorporate what Lunine described as a “seamless harmony” between these two aspects of their lives: faith and science. The Vatican Observatory has two sites: one at the Castel Gandolfo in Rome, which largely has been rendered obsolete due to street light pollution; and the other just outside of Tucson, Arizona, a collaboration with the Mount Graham International Observatory and run in conjunction with the University of Arizona. Scientists involved are leaders in the field and lauded by secular and professional organizations. Brother Guy most recently was honored with the 2014 Carl Sagan Award, presented by the American Astronomical Society. Such things fly in the face of what most people assume of scientists, that faith and reason are incompatible, and that to be involved in the study of the universe means to take up the atheism of Richard Dawkins or Stephen Hawking. Lunine is quick to emphasize the opposite. Lunine could not resist plugging an “advertisement” of his own: he is one of the principal founders of the now 900-strong Society of Catholic Scientists, a listed organization in the Official Catholic Directory under the sponsorship of the Archdiocese of Philadelphia. Its purpose is to witness to the harmony of the vocation of science and the life of faith, and exists “as a place where Catholic scientists can share their knowledge, perspectives, and intellectual and spiritual gifts with each other for their mutual enrichment, and with fellow Catholics and the wider community,” according to the society’s literature. Archbishop Charles Chaput has been the episcopal moderator of the society’s board of directors since the organization’s founding in 2016. One of the great initiatives of the society has been to organize and sponsor so-called “gold Masses” as celebrations of the harmony between faith and science. Similar to “red Masses” and “blue Masses” celebrated annually for lawyers and law enforcement, gold Masses are for Catholics who are or have been involved with science, including scientists, retired or former scientists, science teachers at any level, science graduate students and undergraduate science majors, as well as all of those with an interest in science, formal or informal. Gold is the color of the academic hood of scientists. Philadelphia’s own gold Mass was celebrated Nov. 15 at SS. Agatha and James Church. Significantly, it was the feast day of St. Albert the Great, the Dominican scholar and patron saint of scientists and astronomers. Born around 1206, “Albertus Magnus” was noted for his great works in the natural sciences, and perhaps most famously, his star pupil, St. Thomas Aquinas. Dominican Father Thomas Davenport, who was a Stanford physicist before entering the Dominicans, was the homilist for the Mass. During the Q & A session Nov. 8 with Lunine, one student asked the physicist how to respond to friends struggling with the idea of faith or anyone else who holds science as antithetical to religion. Lunine’s answer was very Catholic: “Be gentle,” he said.